I recently saw a (new) directional sign for this location. 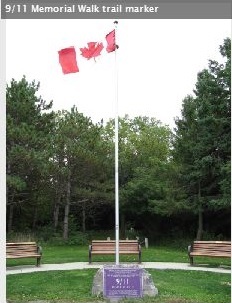 I had no idea Canada had some sort of memorial. Coincidentally, one can see a clear view of the entire Toronto skyline, from top to bottom, from this location across the lake. It’s around 33 miles away. Good listen on 9/11,although no mention of September Clues and also their wrong belief in Judy Wood’s dusty theories. Both are good speakers using good audio.